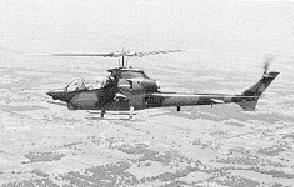 The Bell Model 309 King Cobra was an experimental attack helicopter based on Bell's successful AH-1 Cobra. The Bell Model 409/YAH-63 was an experimental attack helicopter for an Advanced Attack Helicopter (AAH). Hughes' Model 77/YAH-64 was selected over Bell's entry. Closely related with the development of the Bell AH-1 is the story of the Bell UH-1 – predecessor of the modern helicopter, icon of the Vietnam War and still one of the most numerous helicopter types in service today. At the same time, despite the Army's preference for the AAFSS – for which Bell Helicopter was not selected to compete – Bell stuck with their own idea of a smaller and lighter gunship. In January 1965 Bell invested $1 million to proceed with a new design. Mating the proven transmission, rotor system, and the T53 turboshaft engine of the UH-1 with the design philosophy of the Sioux Scout, Bell produced the Model 209. In Vietnam, events were also advancing in favour of the Model 209. Attacks on US forces were increasing, and by the end of June 1965 there were already 50,000 US ground troops in Vietnam. 1965 was also the deadline for AAFSS selection, but the programme was stuck in technical difficulties and political bickering. The US Army needed an interim gunship for Vietnam and it asked five companies to provide a quick solution. Submissions came in for armed variants of the Boeing-Vertol CH-47A, Kaman UH-2, Piasecki 16H Pathfinder, Sikorsky S-61, and Bell 209. On 3 September 1965 Bell rolled out the prototype, and four days later she made her maiden flight, only eight months from the go-ahead. After the Model 209 had faced an evaluation against the other rival helicopters, in April 1966 the US Army signed the first production contract for 110 aircraft. By June 1967, the first AH-1G HueyCobras had been delivered. Originally designated as UH-1H, the "A" for attack designation was soon adopted and when the improved UH-1D became the UH-1H, the HueyCobra became the AH-1G. Bell built 1,116 AH-1Gs for the US Army between 1967 and 1973, and the Cobras chalked up over a million operational hours in Vietnam. The United States Army issued a request for proposals (RFP) in 1972 for an Advanced Attack Helicopter (AAH). From an initial list of 5 manufacturers, Boeing-Vertol, Bell, Hughes, Lockheed, and Sikorsky, the finalists selected were Hughes Aircraft's Toolco Aircraft Division (later Hughes Helicopters) and Bell. Hughes' Model 77/YAH-64 was selected over Bell's Model 409/YAH-63 in 1976. The AH-1G was purchased by the US Army as an "interim type" for the "jungle fighting" role, but the Army's broader concern was the task of protecting Western Europe from the legions of Warsaw Pact armor to the east. The Army had initiated the AAFSS program to develop the Lockheed AH-56 Cheyenne for the anti-tank gunship role, but development of the Cheyenne did not go smoothly, and as one writer put it, "the vultures began to gather", with Sikorsky and Bell trying to sell unsolicited alternatives to the Army. The Sikorsky offering was the "S-67 Blackhawk", a sleek gunship, which despite the name was no real relation to the later S-70 Black Hawk utility-transport helicopter. The Bell offering was a refined HueyCobra, the "Model 309 KingCobra". Bell announced the KingCobra program in January 1971. Two prototypes were actually built, one with a P&WC T400-CP-400 Twin Pac dual turboshaft engine system much like that used on the AH-1J, but with a stronger drive train allowing full 1,340 kW (1,800 SHP) operation, and the other with a single Lycoming T55-L-7C turboshaft engine with 1,490 kW (2,000 SHP). The airframe was strengthened and the tailboom was lengthened, making the KingCobra 1.1 meters (3 feet 7 inches) longer than the AH-1G. A new rotor was fitted, with forward swept tips and a diameter of 14.6 meters (48 feet), compared to 13.4 meters (44 feet) for the AH-1G. The new rotor blade improved lift and reduced noise. An enlarged 20 millimeter ammunition drum, derived from the General Dynamics F-111 Aardvark bomber, was fitted, giving the KingCobra a deeper belly. A sensor system for night and bad weather fighting was fitted beneath the extended nose. This "Stabilized Multisensor Sight (SMS)" was derived from technology developed for the AH-56 Cheyenne, and included a FLIR, an LLTV, a laser rangefinder, and a missile guidance system. The SMS could display imagery on either the gunner's sight or the pilot's head-up display (HUD). The pilot had his own LLTV, mounted in the front of the rotor fairing, to allow him to fly while the gunner hunted for targets. New avionics were incorporated, including a Litton inertial navigation system (INS) that could store 16 different preprogrammed navigation waypoints; a radar altimeter with a ground warning system; and other improved navigation and communications gear. The primary weapon of the KingCobra was to be the new wire-guided "BGM-71 TOW" anti-tank missile, which had proven highly effective in combat test firings in Vietnam from Huey gunships. This weapon could be carried in a pack of four missiles, with one pack under each stub wing for a total of eight missiles. On launch, the TOW trailed out wires to communicate command guidance updates. The missile had two infrared flares on its tail to allow the SMS to track it. All the gunner had to do was keep the target in his sight, and the missile fire control system adjusted its flight appropriately. Both the gunner and the pilot had Sperry Univac helmet-mounted sights to allow them to acquire targets for the KingCobra's missiles and gun. A long-span "big wing", 4 meters (13 feet) wide, was designed for the KingCobra, but apparently never fitted except as a static mockup. The "big wing" was to provide additional fuel and stores carriage capability. The single-engine KingCobra first flew in January 1972. Other than engine fit, it was almost identical to the twin-engine KingCobra. As it turned out, the single-engine prototype was wrecked in an accident in April, and to complete US Army evaluation the twin-engine KingCobra was modified to the single-engine configuration. The evaluation, which pitted the KingCobra against the Lockheed Cheyenne and the Sikorsky S-67 in a competitive fly-off, began in the spring of 1972 and was completed in July. In August, somewhat to everyone's shock, the Army rejected all three helicopters! The simplest way to explain such a seemingly absurd result was that the Army's requirements had changed enough to require a serious rethinking of their helicopter gunship requirements, and the whole AAFSS program had become completely bogged down in politics anyway. The cancellation of AAFSS was immediately followed by the initiation of a new "Advanced Attack Helicopter (AAH)" program. The Army specified that the AAH was to be powered by twin General Electric T700 turboshaft engines with 1,120 kW (1,500 SHP) each, the same powerplant fit specified for a new Army utility helicopter competition that would be won by the Sikorsky S-70 Black Hawk. The AAH would be armed with a 30 millimeter cannon and sixteen TOW anti-tank missiles. The missile armament specification was later modified to include an alternate load of 16 laser-guided "AGM-114 Hellfire" anti-tank missiles. Hellfire was then in development and promised greater range and lethality than TOW. Boeing-Vertol, Bell, Hughes, Lockheed, and Sikorsky all submitted proposals for the AAH program. In June 1973, Bell and Hughes were selected as finalists, and were each awarded contracts for the construction of two prototype aircraft. The Bell entry, the "Model 409" or "YAH-63", was by no means "just another Cobra design", though it leveraged off Cobra technology where possible. Although it had what had become by then the typical configuration for a helicopter gunship, with a sharklike fuselage, tandem crew seating, and stub wings for armament, the YAH-63 was largely a new machine. Distinctive features included wheeled tricycle landing gear; flat canopy window plates; an unusual "tee" tail; a large ventral fin; and a three-barreled GE XM-188 30 millimeter cannon. One less noticeable feature was that the pilot occupied the front seat instead of the back, the reverse of the AH-1's arrangement. This was felt to be more prudent since the YAH-63 was intended to fly "in the treetops", or what is more formally called "nap of earth (NOE)" operations, and the pilot needed to have a clear view of the surroundings. 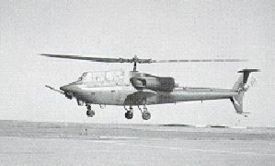 The first prototype of the YAH-63 made its initial flight on 1 October 1975. This rotorcraft crashed in June 1976, but a static test prototype was brought up to flight standard and, along with the second prototype, entered the flyoff against the Hughes entry, the "Model 77" or "YAH-64". The YAH-64 was selected the winner in December 1976, and entered service as the "AH-64 Apache". The Army felt the YAH-63's two-blade rotor was more vulnerable to damage than the Apache's four-bladed rotor, and the service didn't like the YAH-63's tricycle landing gear scheme, feeling it was less stable than the Apache's "taildragger" configuration. Some observers also suspected the Army didn't want to divert Bell from AH-1 production. Model 249: Experimental version fitted four rotor blades. Model 309 King Cobra: Experimental version powered by one Lycoming T-55-L-7C engine. Model 309 King Cobra: Experimental version powered by two engines. This page was last edited on 8 October 2009, at 15:07.